The Endangered Species of Austin Poster shows 16 beloved Austin landmarks in vivid color, on quality paper from my Vanishing Austin photography series. 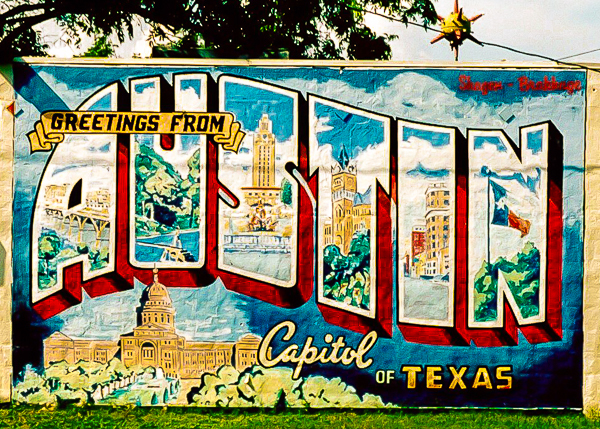 Offering a great showcase of our favorite Austin icons—some gone, some endangered, and some enduring—it’s sized at 24 x 36,″ for a ready-made poster frame, and makes a splashy eye-catcher on any Austin lover’s wall. Thanks for your purchase—it supports my ongoing Vanishing Austin photography series. About the series: Vanishing Austin is my photo homage to Austin’s irresistible scenic gumbo. See all 99+ prints HERE. Since 2004, I’ve been trying to stay ahead of the wrecking ball by photographing Austin’s architectural eye candy, landmarks and icons, with more than 99+ images to date. What’s been lost, and what remains, are immortalized in print in my signed, limited editions at the VANISHING AUSTIN SHOP.